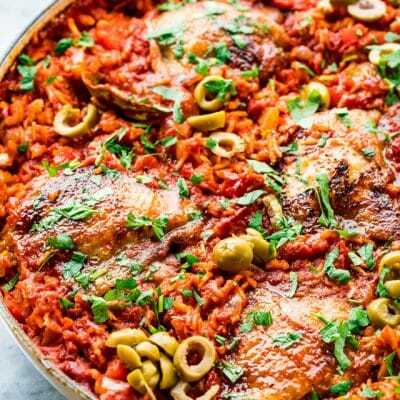 This One Pot Spanish Chicken and Rice is packed with great flavors and vibrant colors! 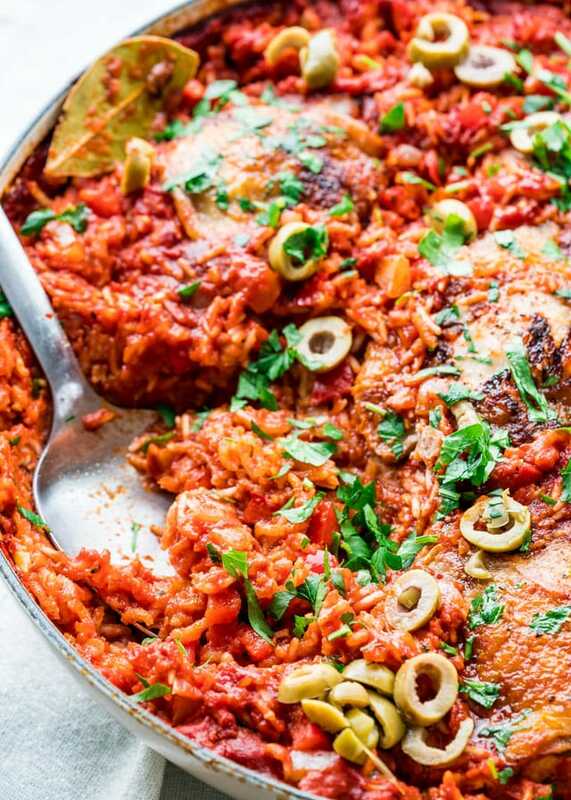 Easy to make and all in one pot, from the stove top to the oven, dinner is ready with no fuss! Being a new puppy mom certainly has its challenges and I’d forgotten most of them. The chewing, the potting training, all that puppy energy, it sure can get exhausting. Not to mention the last time I had a puppy I was a lot younger with a lot more energy. But as much as I complain about the little bugger, I’m so glad we got him. We were so sad after we lost our Mia last year that I never thought I’d get another dog again. Truth be told, a house without a dog is boring and sad. A puppy changes all that and Indiana sure changed our lives in the short few weeks we’ve had him. Let’s not even talk about my dog allergies, which I’m just thankful I finally found some allergy pills which actually work on me. As usual if you want to see more pictures or videos of Indiana and his adventures visit me on Instagram. But enough about puppies, let’s talk chicken and rice. While this dish may take a little longer to cook it’s really easy and quick to put together. Most of the time you just wait for it to cook in the oven. 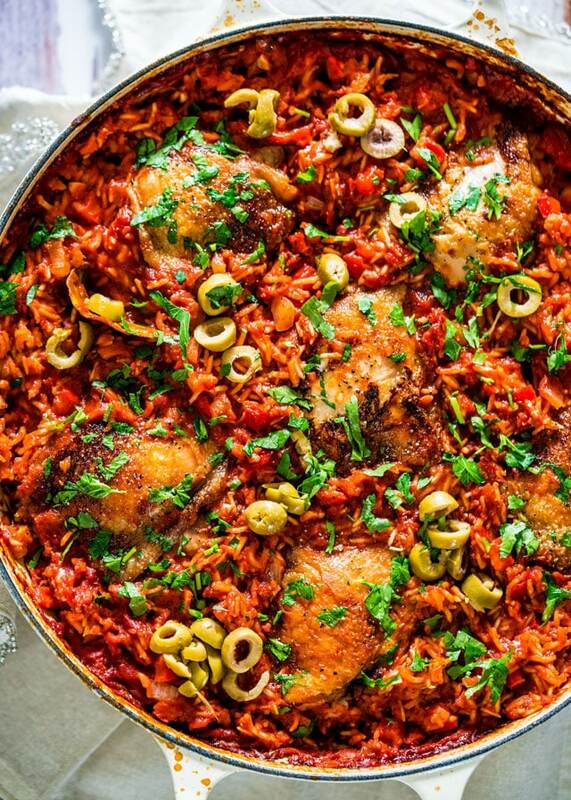 So this really is a chicken and rice bake with a lot of other goodies in it. 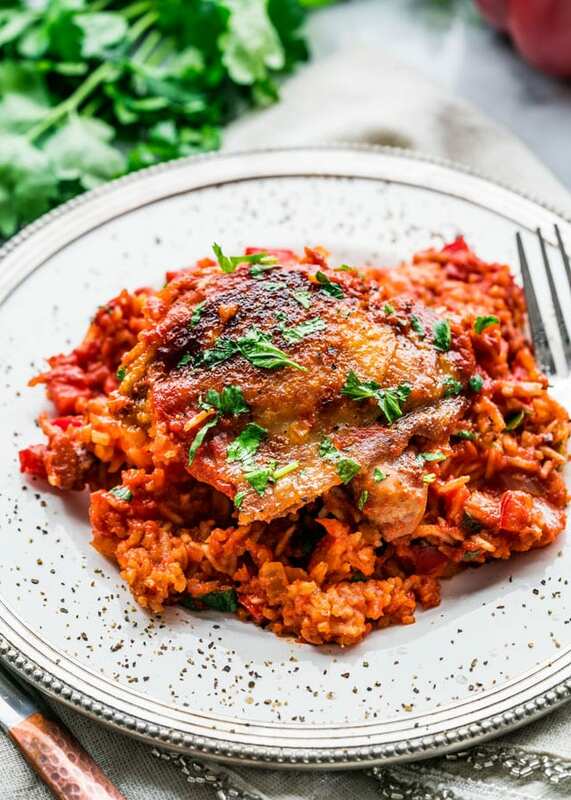 Chicken and rice is a pretty basic and common dish in all households all over the world. There literally are thousands of different variations. There’s a reason for that, it’s easy to make and it’s pretty darn delicious too! 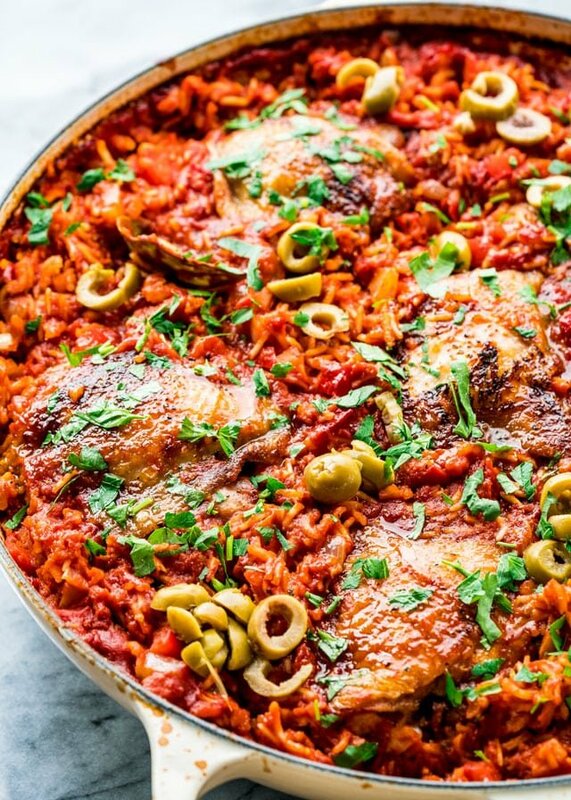 This Spanish version is really my take on it, and by no means is this some authentic Spanish rice dish. I just used some basic common Spanish spices and herbs. To get the nice red color of this rice I actually used some smoked paprika and tomato paste, but if you really wanted to be more authentic when it comes to Spanish cooking you could use some saffron. I know saffron is quite expensive, actually the world’s most expensive spice, and not a lot of people have it in their spice cabinets, so I went with somewhat more common spices. I did want to add some heat to this dish so I added a bit of red chili flakes which you could also replace with cayenne pepper. Let’s not forget all the garlic in this dish, or shall we say vampire repellent? Chicken thighs were my meat of choice but feel free to use chicken breast or drumsticks, whatever you have in your freezer and like. You could also add more herbs to this dish like some rosemary which is popular in traditional Spanish cuisine or some oregano. Use this recipe as a basis to build your own recipe, don’t be afraid to experiment with spices and herbs in your kitchen. What’s the worst that could happen? If you’re not feeling confident enough to come up with your own version, try some of mine! In a large Dutch oven or oven proof cast iron skillet/pan heat the olive oil over medium heat. Add the chicken thighs, skin side down and cook until crispy and golden brown. Season generously with salt and pepper. Turn the thighs over and sear until golden. Transfer the thighs onto a plate and set aside. To the same skillet add the onion, garlic and bell peppers. Cook for about 3 to 5 minutes until the onion and peppers are soft. Add the red pepper flakes, smoked paprika, bay leaf, tomato paste and stir. Season with salt and pepper as needed. Stir in the rice, crushed tomatoes and chicken broth. Bring to a boil. Transfer the chicken back to the skillet on top of the rice. Place the skillet in the oven and bake for about 45 minutes or until the rice is cooked through. You could cover the skillet for the first 30 minutes and then remove the lid for the last 15 minutes. Garnish with green olives and parsley and serve warm. If you use brown rice, cook for an additional 15-20 minutes, or until the rice is tender. You can use any type of chicken you prefer. If you're using chicken breasts, cook for an additional 10 minutes in the oven. Store leftovers in an airtight container for 3 to 4 days. Yes definitely, 45 minutes is plenty for chicken breast! I would still sear on nice and high heat. That will help your chicken come out crispy after it cooks with all that liquid. First time using my Dutch oven with this recipe. It turned out beautifully! Of course I made some adjustments since I didn’t have all the ingredients- I used a can of Rotel and a can of diced tomatoessince I didn’t have any crushed tomatoes and I think it turned out well. I added some mozzarella cheese to the plated dish since I like cheese. The instructions were easy to follow and I modified the cook time slightly due to the fact I was using long grain wild rice. This is a keeper recipe! Has anyone tried substituting brown rice in this recipe? Do I need to adjust the cooking time? You can and yes brown rice cooks slower so you’ll need to adjust the cooking time. Hi, can drumsticks be used? Thanks Jo for a straight-forward, one pot recipe. Made this tonight and it was great. Can this be made without thd tomatoe paste? Have everything on hand except that! I suppose you don’t need it, as long as you have the crushed tomatoes. It just gives it a richer flavor. I made this last night. It was a huge hit! Subbing in existing pantry/freezer ingredients : (boneless skinless thighs, Kalamata olives, and smoked Basmati rice, it was still excellent. This will be on the “definitely do again” list. So glad you tried the recipe and enjoyed it. Hi Jo. What do you think would be the cooking time if I substituted in breasts in stead of thighs? I would cook it an extra 15 minutes or so but should work fine with substituting breasts. I have some boneless chicken in my freezer. Can I switch it out for the bone in? This looks so good. I hope that will work.